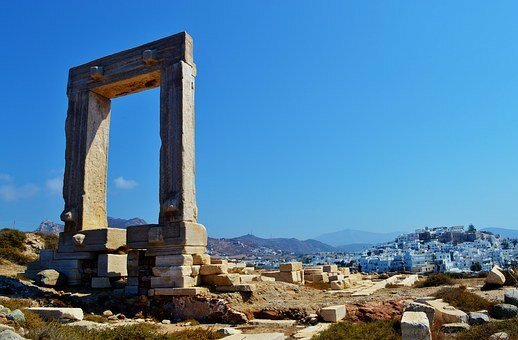 Walk hand in hand through the brightly colored doors of the Cyclades with this 10-day family itinerary. 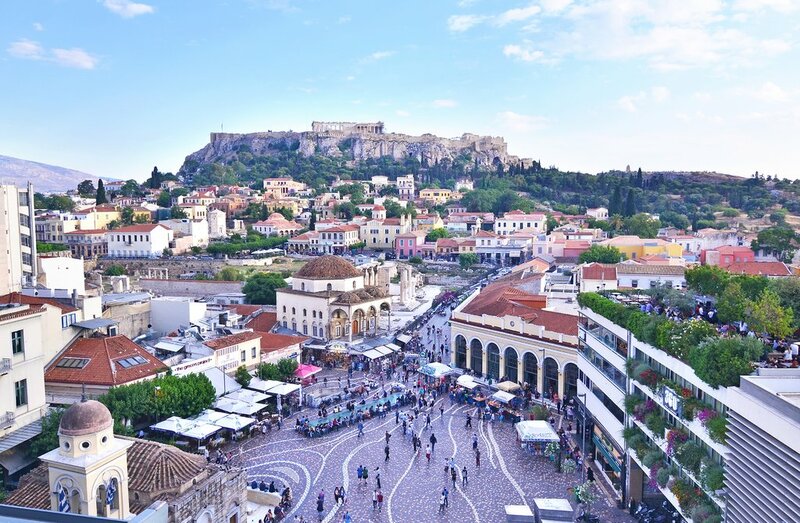 After an Athenian mythology tour, you'll sail to the islands for a slew of activities, with farm dinners, bike rides, horseback tours, and a cruise through the caldera on wooden ship all on the agenda. 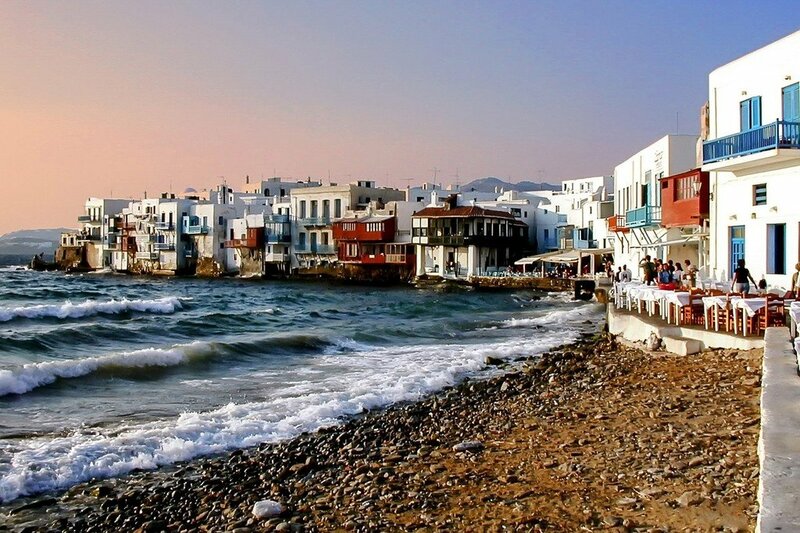 You'll start your time in the islands on Mykonos, one of the most famous islands in the Cyclades chain. 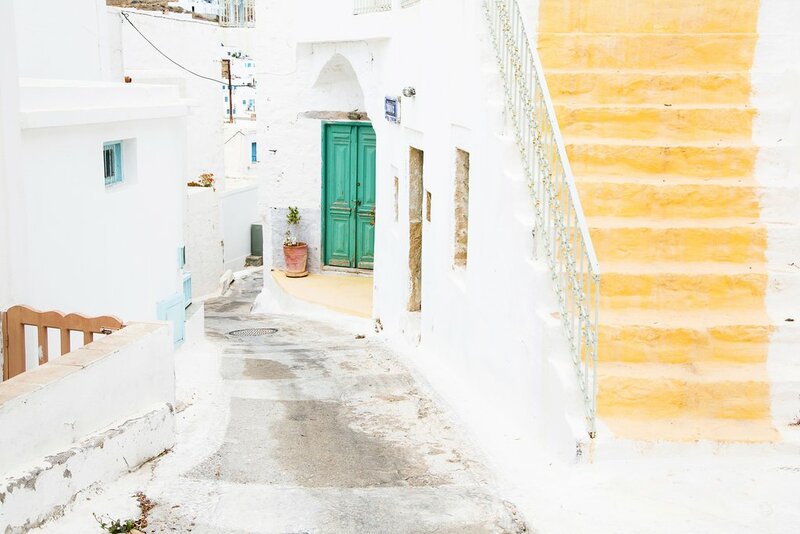 Known for its glitzy restaurants and nightlife, art scene, and jet set crowds (it was recently home to a Gucci pop-up boutique), Mykonos will throw you headfirst into your island adventure. 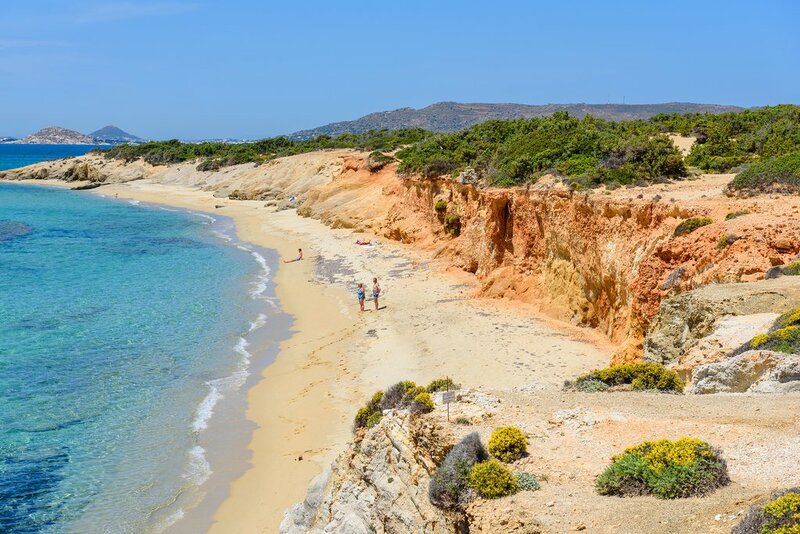 If you need to get your toes in the sand immediately, head to remote Agios Sostis beach to find your own isolated paradise. For a more active experience, Ftelia Beach is known for its excellent windsurfing. Stroll through Little Venice, an 18th-century neighborhood where colorful former captains' mansions and seaside restaurants seem to sprout straight from the sea. It's also right next to the island's famous hillside windmills for great photo ops. The morning is yours to explore, so head to a beach to lounge or stroll through the cosmopolitan streets, scoping out the boutiques that draw the island's stylish crowd season after season. 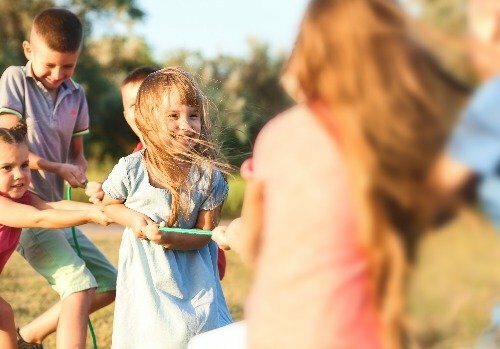 In the afternoon, you'll pay a visit to a traditional farm. Talk to the farm's caretakers to learn about how vegetables are grown on the islands and how the livestock are raised, and even say hi to the animals. As the sun begins to set, you'll sit down to a traditional dinner. 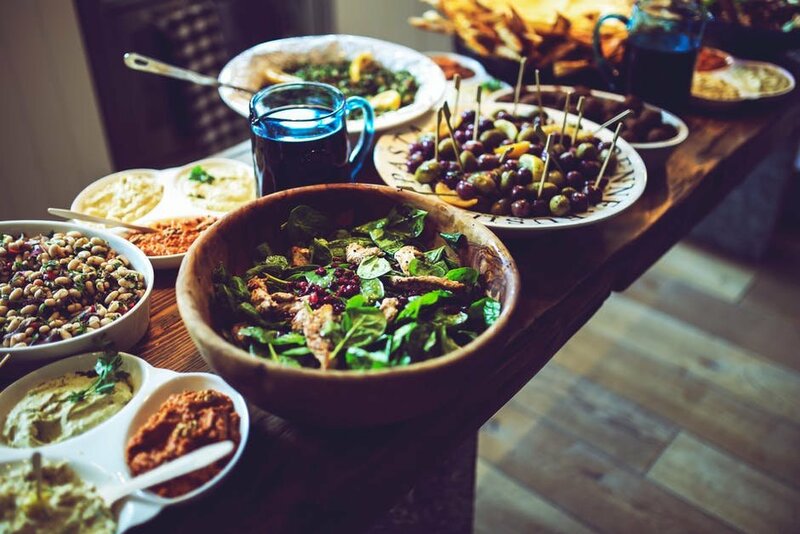 You'll be welcomed into a local Mykonian household for the meal, where you'll experience the traditional Greek way of life, culture, and cooking. Hear all about their stories of the island's culture and history as well as their own family history, over authentic dishes and free-flowing local wine (for the older crowd). Hike up to the summit of Mount Zas, the mythological childhood home of Zeus, the ruler of the gods, and the highest point in the Cyclades. Head inland to the town of Chalki, home to the island's oldest market and a petite, shady square perfect for whiling away the afternoon. Stop at the kitron distillery to sample the local liqueur and learn about its distillation process over the years. Visit the Temple of Demeter at Sangri on your way. Multiple deities of fertility were worshipped here, particularly the goddess Demeter. The temple was constructed in 530 BC, during the tyranny of Lygdamis, and represents a precursor of classical Athenian architecture. Stroll to the Portara, the entrance to the Temple of Apollo. Construction on the temple began in the sixth century BCE but was never finished, but the still-standing entranceway has become one of the hallmarks of the island. You can find it on the islet of Palatia, just over a causeway from the heart of Naxos Town (Chora). 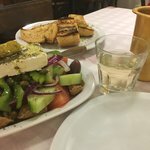 For dinner, wander up the hill through the streets of the Kastro neighborhood to pick out your favorite of the area's tavernas, where you can sample the island's fresh produce in its best forms. 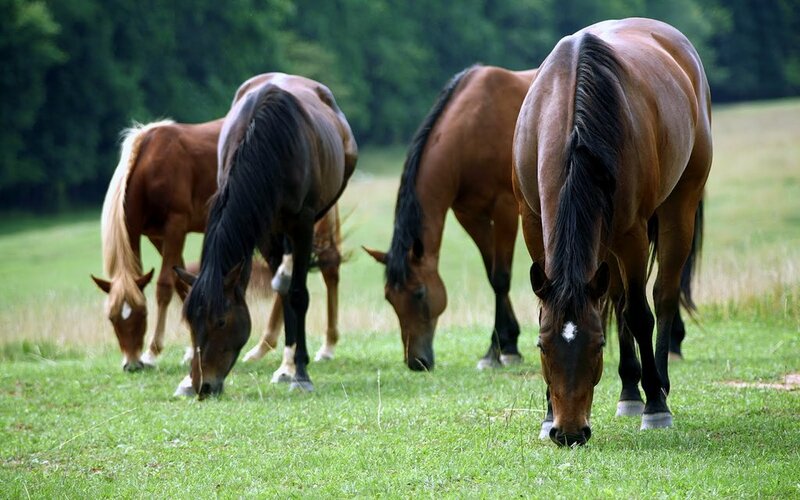 Get a different perspective on the island from atop one of its resident horses. The stable will work with you to create a ride that suits your age and skill level to maximize your experience and trail route. A trip to the village of Apiranthos is a potential ride highlight. Also known as the "marble village" due to its white architecture and marble stone streets, this mountainside spot offers inland views and a slew of museums and crafts to peruse. Listen for the local dialect among the residents, which has remained distinct from the rest of the islands. What's a trip to the islands without a day on the beach? With smaller crowds than its Cycladic neighbors, Naxos makes it easy to find your own slice of paradise, whether you want privacy or a more lively scene. Terminology tip: If a beach is described as "organized," that generally means it has sunbeds and umbrellas available to rent and plentiful restaurants. Agios Georgios is the closest to the main town and generally filled with families enjoying the shallow waters. Neighbors Agia Anna and Agios Prokopios also have plenty of amenities on their sweeping sands, with enough shoreline that you'll be able to stake out a spot but sufficient tavernas to keep you fed. The more isolated beaches of the southwest coast—including Plaka, Mikri Vigla, and cedar-lined Aliko—are some of the best on the island. They're farther out from the main town, and your travel will be rewarded with quieter sands and scenic surroundings. 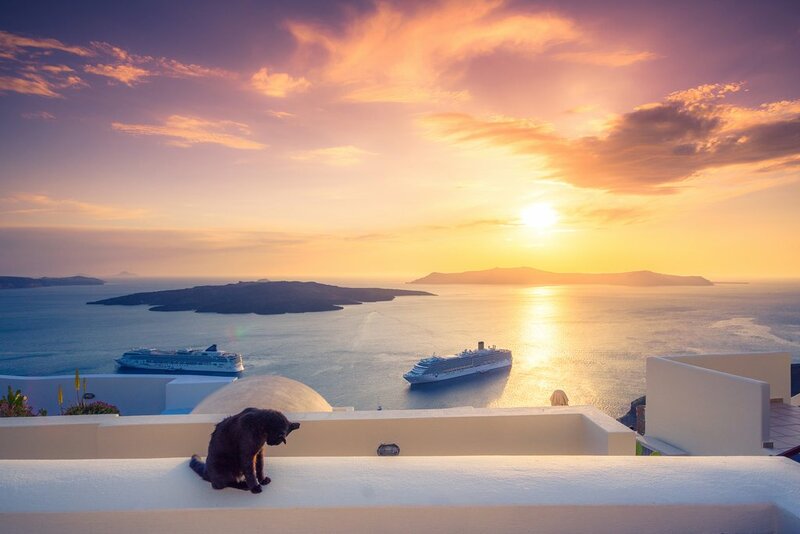 After breakfast at your hotel, you'll get an early ferry to Santorini. Nothing says "good morning" like watching the sun coming up over the island's iconic cubic architecture. Upon arrival, you'll take in the island's central caldera—the site of one of the largest volcanic eruptions in history—rising above you. The island's volcanic history has led to the formation of some of the more unique beaches in the Greek islands, along with the dramatic cliff views on the island's caldera side. Spend your day relaxing at the beach or catching some exercise—and even more views—from one of Santorini’s more than 12 scenic walking routes, ranging from between two to eight miles each. At dinner, sample the island's signature cherry tomatoes and white eggplants as guest stars in seafood dishes or the main event. No trip to Santorini is complete without an exploration of its iconic caldera. 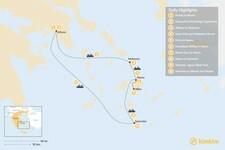 The island is shaped by the volcanic eruptions of its past, the most intense of which is known as the Minoan eruption in the mid 2nd millennium BC, when the volcano created the island's current structure and was felt around the ancient world. 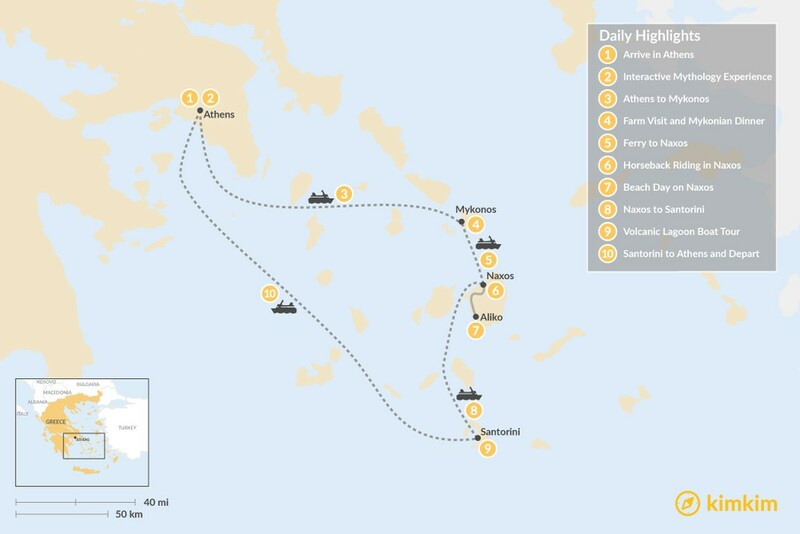 After breakfast, you'll be transferred from your hotel to the port of Athinios, where you'll hop on a traditional wooden boat to begin your journey. 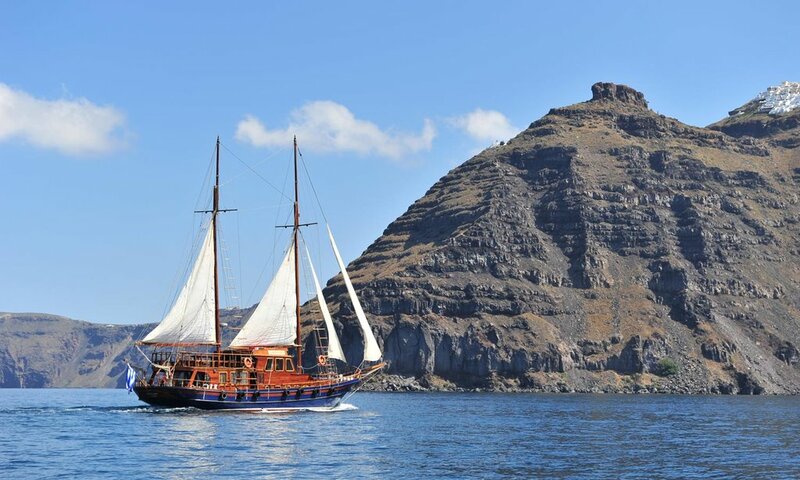 You'll sail the caldera for six hours, seeing the majority of the lagoon with a guide providing the details and backstory of your surroundings. Head across the basin to the two small lava islets in its center. These are the youngest of their kind in the eastern Mediterranean, only forming about 50 years ago. Stop to hike around the rocky red soil of the islets before hopping in the hot springs at Nea Kameni. These yellow-tinted waters are high in sulfur and renowned for their potential therapeutic benefits. 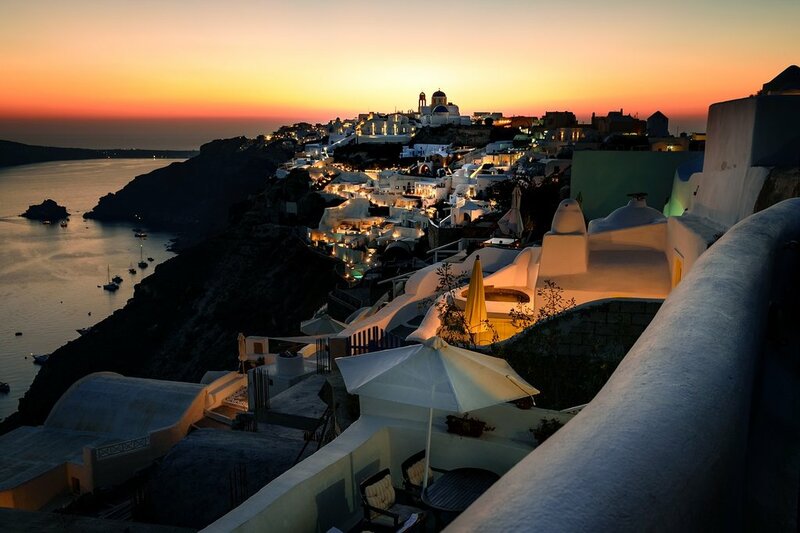 You'll also take a break to purchase lunch on the less famous island of Thirassia and enjoy the views of the cliffs of Oia rising across the water. If you're up for it, take a hike up to the island's main village of Manolas, which feels like Oia may have before the arrival of tourism. It's time to say farewell to Greece! Savor one more breakfast in Santorini before your transfer to the airport or your ferry to begin your journey home.